For this week's Muffin Tin Monday the appointed theme from the Muffin Tin Mom was "food pyramid/nutrition". I thought it was an interesting theme choice since the regular old food pyramid so many of us grew up with seems to have undergone so many face-lifts and transformations over recent years. The question of whether the pyramid should even continue to be used as a guide for healthy eating is an oft debated one. Still, I couldn't pass up the opportunity to craft my own actual food pyramid. Just for old times sake. 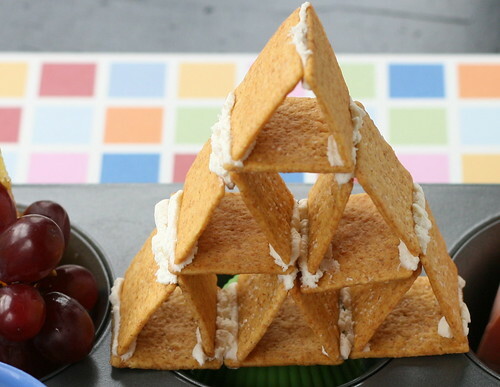 It's made of Wheat Thin crackers and cream cheese, constructed just like a little house of cards. I scored a lot of "cool mom points" with Ethan on this one! ;-) "It's kind of like a gingerbread house, but without the candy. And it's cooler." That is some fantastic praise from the mouth of an architect-wannabe 8 year old! Are you curious what it could possibly be? It's very related to the theme of this MTM! To find out more (and to enter!) you'll need to click HERE. I love the pryamid. It looks like it would be tricky. cute cute cute with the wheat thins!! Absolutely awesome! A nice fun yet healthy muffin tin. With beautiful colors as usual. Love your photos. My grandbabies would LOVE these! 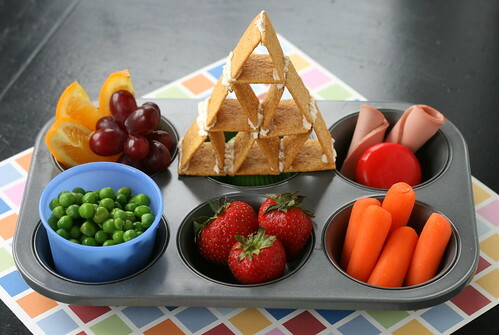 I love this, especially the wheat thin pyramid! Great job. I'm headed to the store now so may need to make up one of our own today! I am hit or miss on participating but this one is totally doable. What a great meal! Your food "Pyramid" is sooo fun! Great job my dear! Very creative! I didn't have the gumption to try making a pyramid! Love it! Your pyramid is fantastic! You are so darn creative and I always look forward to what you make. Such a colorful meal! Love the pyramid!! Not sure what happened to my comment. Just wanted to say I think it is really cool, nice and colorful. And I love the pyramid. So, I thought of you...this site has a link to another site that has Goodbyn's for sale - $15 - unless what she says is true - that you get a $25 credit for signing up, then they are free. No this is not spam - I really do read your blog and love your posts. Anyway, check it out. Could you use this link if you do decide to order? Thanks! I already have two Goodbyns, and that is plenty for me! That is a great deal on them though! PlanetBox - (almost) turkey time! catching up: a whole lot of bento pictures!